Best Deluxe Table Top Easel - This heavy-duty professional tabletop easel can be used by itself on any flat surface, or with the Terrero Taboret. It folds easily to a variety of angle settings, even flat! Base measures 18 inches wide x 18 inches deep. Holds canvases up to 36 inches, extended height 47 inches. 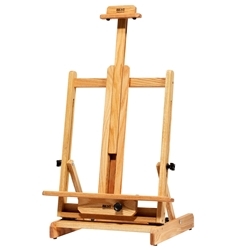 This easel can be shipped by UPS for $34.95 anywhere in the 48 contiguous states. Little to no Assembly, just take it out of the box and start painting. Lifetime Guarantee.